One of the greatest joys in my life is singing – just for the sheer joy of it. This song is written from his perspective. In the early 1900’s, my husband’s maternal grandparents homesteaded in South Dakota. Two photographs inspired this song: one was of Alma hanging laundry in a stiff wind by their small tar-paper shack, and the other of the newly married couple heading out onto the Plains in their horse-drawn carriage. It was the seeds of my misfortune they would sow? Inspiration for this love song arrived on a beautiful summer evening in West Virginia while camping with my husband and our son. We were alone on a hill above a river, bordered on one side by trees and another a freshly sown cornfield. The evening fog settled in and the fireflies began to blink low over the cornfield. As the night progressed the fog lifted revealing a star studded sky and a host of fireflies extending from the ground to the treetops. It was magical and we stood together in the middle of the field in silent wonder of it all. My front yard garden began when we lost a great laurel oak. I planted a live oak to replace the laurel and then dug up all the remaining grass and started seeding wildflowers. Almost every day someone stops to admire the flowers, birds, and butterflies. The garden reminds me just how miraculous all this life on Earth really is and how truly connected we are to all that is living. This story comes straight from my childhood. A powerful memory emerged when I was digging deep into my past, rediscovering myself as a little girl growing up in the South during the 1960s. Rio was inspired by a story written by Steve Friedman, about Skip Conrad who lived beside El Rio de las Animas Perdidas, the last free flowing river in Colorado and the largest undammed river in the lower 48 states. Skip disappeared in the mountains of Silverton, Colorado and his body was never found. His story struck a deep chord within me, partly because I have backpacked many times in the mountains of Colorado and share his love of the wilderness. I read an interview with Neil Young, one of my favorite songwriters, in Rolling Stone Magazine. He likened songwriting to sitting quietly beside a rabbit hole and waiting for the rabbit to come out. That night I had one of my “architectural” dreams, where I visit structures that have existed in my dreams for years. This structure was a rambling beach house behind the dunes with many outbuildings in various states of disrepair. I realized at some point in the dream that it didn’t make sense to restore it and I came to the liberating decision to tear it down. Upon waking I felt the freedom of a burden lifted, quiet descended and my muse came out of the rabbit hole and hung with me for a while. This is my attempt to capture a transcendent experience I had at the beach. The first time I went to Summersongs songwriting camp I was challenged to write a song about a woman who abandons her children. I couldn’t do it. A couple of months later I saw John Sayles’ movie “The Secret of Roan Inish” which was based on the Scottish/Irish myth of the Selkie Seal. Suddenly everything clicked. Standing on a shell mound on the Gulf coast of Florida, I began to wonder what life would have been like as a woman of the Calusa, the most powerful indigenous tribe in Florida. This song is my first collaboration with my friend and fellow astronomer, Lisa Aschmann. This song follows the storyline of a guided meditation all the way to sitting down in a chair inside a tree. I fell asleep during the meditation and the rest of the song is the crazy dream that ensued! Leading deep down into who knows where? This is the story of Autumn Lily, who was born prematurely with a birth weight of under two pounds, and who is now a beautiful and thriving little girl. I was moved by a photograph which showed her father’s wedding band loosely encircling her tiny arm. This song poured out of me following my visit with her in the neonatal intensive care unit. When is a songwriter ever finished with a song? When the song is finished with the songwriter! This song has taken me on a long journey through countless rewrites and rearrangements. When a friend suggested that perhaps the song was not about giving something up, but rather giving up “to something,” it all came together. 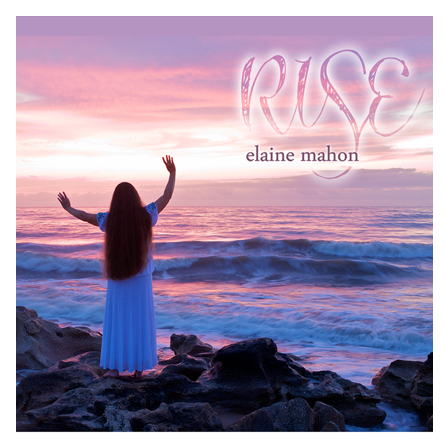 to my wonderful husband and son, John & Sam Mahon, for their love and whole hearted support of my artistic endeavors; Elisabeth & Lon Williamson of Gatorbone Studios for sharing my vision for “Rise” and bringing all they had to bear on its recording and production including instrumental & vocal support, friendship, artistic insights, great dinners and the best studio experience ever; all of the incredibly talented musicians, artists & engineers that contributed to this project: Penny Nichols, Gabriel Valla, Hannah Alkire, Jason Thomas, Tuck Tucker, Dave Kelsay, Kim Blackburn, Pete Winter, Butch Hause, James Quine, Callie Williams and Annie Capps – each of you put your heart and soul into your work and it shows; and my creative co-writers Lisa Aschmann (Calusa), Steve Friedman (Rio), Tom Nelly (The Selkie Bride), and Elisabeth & Lon Williamson (One by One). Special thanks to Penny Nichols, Kari Estrin, Bob Franke, Cosy Sheridan, John Martucci, Glen Roethel, Pat Wictor, Steven Prasinos, Brandy Kerschner, Bob McPeek and David Beede who shared valuable artistic insights, and to everyone that has offered encouragement and support along the way especially Mom & Dad, my family & friends, and to Michael O., Chuck & Betsy G., Lila M., Richard B., Diane C., Amy S., Joseph S., Shelley & Dave W., Freddie J., Frank S., the Summersongs songwriting community, the Shake Rag Gallery folks, the Sandhill Songwriter’s Circle, and to my fans and listeners: “Rise” is for you – enjoy!